All the range of Grandeslam Bait Boats are available for special order from the shop. This remarkable bait boat has been developed over a number of years to give the best facilities and performance of any boat on the market for a fraction of the costs. Electromagnetic failsafe release mechanism and independent hook release features make this the most advanced and effective bait boat ever made. 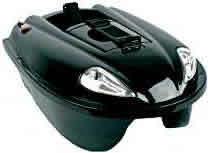 With a host of advanced features it is hard to find a better bait boat at any price level. single joystick manouverability. Over 2Hrs running time and comes complete with mains charger and rechargeable batteries. Twin independent hoppers with patented hopper release system. Twin independent rig holders with patented hook release system. Range 500 to 1000m depending upon environmental conditions. The New ATOM Bait Boat has been specially developed for the UK Angler. Small yet able to carry upto 1.5KG of Bait. Features all the great aspects of its big brother, the Waverunner.